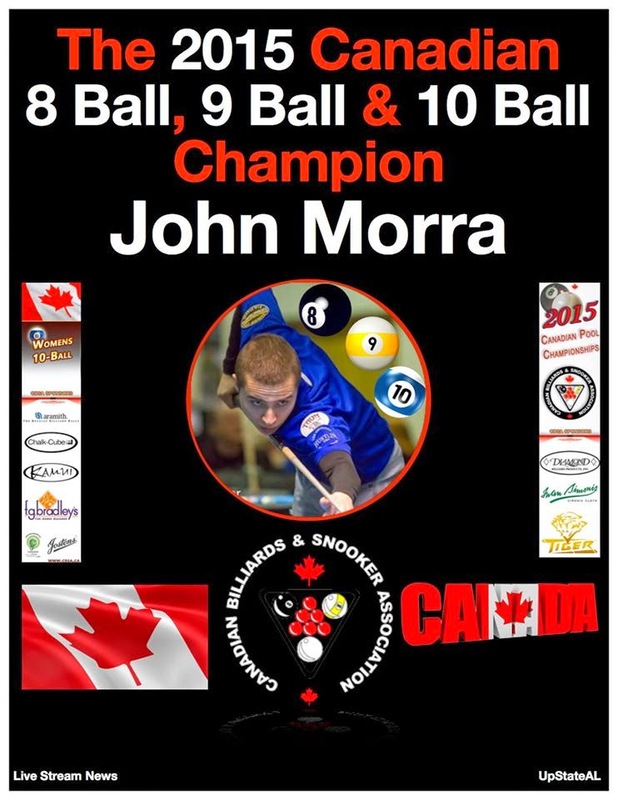 Right now in the Canadian pool scene there is no bigger name than John Morra. He has won several Canadian Championships but this year he decided he wanted them all for himself. When we talk about Morra being the first "Triple Crown" winner we are of course referring to him wining the 8, 9 and 10 Ball titles this year. Some have been quick to point out that Alex Pagulayan has won three Canadian titles in a year but that included a Snooker title, and we can all agree that Snooker is in a separate category than pool. When it comes to the format that took place this week, John Morra is the only Canadian player to even come close to winning all three, not only in a single year but a single week. What is even more impressive than Morra sweeping the Canadian Championships this year is how he did it. The entire week he only dropped one set and that was in the 8 Ball division to Erik Hjorleifson in the winners side final. Morra rebounded from this loss to come back to beat Hjorleifson in the final and went undefeated the rest of the week. In the 9 Ball division Morra cut through the winners side bracket virtually untested. In the final four on the winners side against Jason Klatt, many thought this would be the match where he could falter. However after gaining a 6-1 lead early, Morra went on to easily win 11-3. This set up an all Morra winners side final between John and his father Mario. They were matched up earlier in the week and once again it was the junior of the two Morra's who would win as John got by his father 11-6. In the final he faced Shannon Ducharme from Winnipeg who had shown flashes of brilliance throughout the week. Ducharme was able keep this set close the whole way, but Morra was not going to be denied his place in history. He went on to win 15-12 to become the first ever "Triple Crown" winner. Congratulations to John Morra on his historic run this past week. For his hard work this week he won $3500 plus a trip to three World Championships.